Allows the new, high tech Hemi to be installed in 1959-1974 A, B, C, and E body cars. 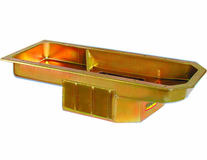 While the Mopar crate motors come with a rear sump pan, that pan will not fit in mid-sump muscle cars. This pan provides a custom fit around the K-member and the drag link and provides an increased power design. Increased oil capacity and oil control are an absolute requirement to handle the demands of higher RPM and increased horsepower. Oil control baffles 100% subdue any unwanted oil movement which results in consistent oil pressure and increased power output. This pan uses the stock dipstick location in the side of the block. 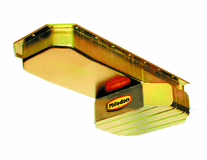 While a stock windage tray can be used, the Milodon #32010 version is improved and will yield better oil control and power output. This is the same tray that the record holding NHRA Challengers run. Includes high strength magnetic drain plug.